Auge, P. 1933. Larousse du XXe siècle, vol. 6 (Paris). Benoît, F. 1955. L'art primitif méditerranéen de la vallée du Rhône (Aix-en-Provence). Déchelette, J. 1914. Manuel d'Archéologie 2,3, second âge du fer ou époque de La Tène (Paris). Drerup, H. 1980. 'Totenmaske und Ahnenbild bei den Römern', Römische Mitteilungen (87) 81—129. Duval, A. Heude, D.. 1983. L'art celtique en Gaule (Marseille/Paris/Bordeaux/Dijon). Hopps, W. 1984. La rime et la raison (Paris). Megaw, J. V. S. 1970. Art of the European Iron Age (Bath). Pobe, M. Roubier, J.. 1961. The art of Roman Gaul (London). Zadoks-josephus jitta, A. 1932. Ancestral Portraiture in Rome (Amsterdam). Zanker, P. 1976. 'Ziir Rczeption des hellenistischen individual portrats', in (ed) Zanker, P., Hellenismus in Mittelitalien, 81-129 (Gottingen). Adamesteanu, D. 1974. La Basilica Antica (Cava dei Tirreni). Carter, J. C. 1978. Ancient crossroads, the rural population of Classical Italy (Austin). Kozloff, A. P. (ed.). 1981. Animals in ancient art from the Leo Mildenberg collection (Cleveland, Ohio). Kozloff, A. P. 1983 (ed.) Tierbilder aus Vier Jahrtausenden, Sammlung Mildenberg German edition by U. Gehrig (Mainz). Mertens, D. 1974 (in) Metaponto, 13° Convegno di Studi sulla Magna Grecia (Taranto). Van buren, E. D. 1923. Archaic fictile revetments in Sicily and Magna Graecia (London). Begley, V. 1967. Archaeological exploration in Northern Ceylon, Expedition, 9/4, 21-9. Begley, V. 1983. Arikamedu reconsidered, AJA, lxxxvii, 461-81. Casal, J. M. 1949. Fouilles de Virampatam-Arikamedu (Paris). Codrington, H. W. 1925. Ceylon coins and currency (Colombo). Dellbrueck, R. 1955—56. Südostasiatische Seefahrt im Altertum, Bonner Jahrbücher, 155-6, 8—58 and 229-308. Draggendorf, H. Watzinger, C.. 1948. Arretinische Reliefkeramik (Reutlingen). Hayes, J. W. 1973. Roman pottery from the South Stoa of Corinth. Hesperia, 42, 416—70. Issings, C. 1957. Roman glass from dated finds (Groningen-Djakarta). Kenyon, K. 1957. Samaria-Sebaste III, the objects from Samaria (London). Oxe, A. Comfort., H. 1968. Corpus Vasorum Arretino-rum (Bonn). Robinson, H. S. 1959. The Athenian Agora V, pottery of the Roman period: chronology (Princeton). Sanmunagathan, S. 1950, 1951. Mantai. Archaeological Survey of Ceylon, Annual Report 1950, 15; 1951, 33. Wheeler, M., Ghosh, A., Krishna, D.. 1946. Arikamedu: An independent trading station on the east coast of India, Ancient India, 2, 17—24. Wickramagamage, C., Hettiarachi, S., Bouzek, J., Bren, J., Charvât, P.. 1984. Excavations at Abhayagiri Vihara (Anuradhapura, Sri Lanka) in 1983, Archiv Orientâlni, 52, 42—74. Atkinson, R. J. C. 1956. Stonehenge (London). Atkinson, R. J. C. 1965. Wayland's Smithy, Antiquity, xxxix, 126-33. Collins, A. E. P. 1952. Excavations at Blewburton Hill, Berkshire Archaeol. J., LIII, 42 and Fig. 7. Hope-Taylor, B. 1984. Analytical excavation: another view, Antiquity, lviii, 214—15. Reynolds, N. J., barber. 1984. Analytical excavation, Antiquity, LVIII, 95—102. Vatcher, F. De M. 1959. The excavation of a long barrow at Nutbane, Hants., Proc. Prehist. Soc., XXV, 15-51. Crawford, O. G. S. 1929. Editorial, Antiquity , III, I.
Reynolds, N. 1980. Dark Age timber halls and the background to excavation at Balbridie, Scot. Archaeol. Forum, 10. Springett, J. A. 1983. Effect, of five species of earthworm on some soil properties, J. Applied Ecology, 20, 865-72. Behrens, H. 1984a. Das Eigentum in der Steinzeit. Diskussions-bemerkungen zu einer gleichbleibend offenen Frage, Materialen zur Vor- und Frühgeschichte von Hessen, 6. Behrens, H. 1984b. Die Ur- und Frühgeschichtswissenschaft in der DDR von 1945-1980 (Frankfurt/Main). Daniel, G. 1971. From Worsaae to Childe: the models of prehistory, Proc. Prehist. Soc, xxxvu/Pt. 11, 140-53. Daniel, G. 1981. A short history of archaeology (London). Klejn, L. S. 1970. 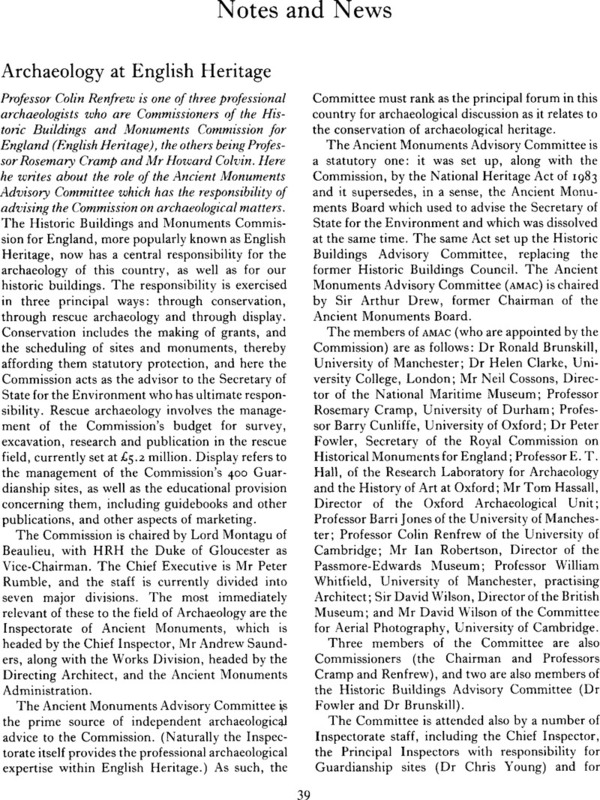 Archaeology in Britain: a Marxist view, Antiquity, XLIV, 296-302. Lucas, E. 1964. Die Rezeption Lewis H. Morgans durch Marx und Engels, Saeculum, 15, 153—74. Thompson, M. 1970. Reply to Klejn (1970), Antiquity, XLIV, 302-03. Esteva, Cruanas, L. 1956/7. Prehistoria de la Comarca Guixolense, Anales Inst. dF.studios Gerundenses, XI, 163-263. Grant, M. 1975. The twelve Caesars (London). Graves, R. 1953. I Claudius (Harmondsworth). Graves, R. 1957. Translation of the 'Twelve Caesars' by Suetonius (Harmondsworth). Green, P. 1970. Alexander the Great (London).